If solid silicic acid develops below the C/Si isotherm (equilibrium temperature), dross develops. 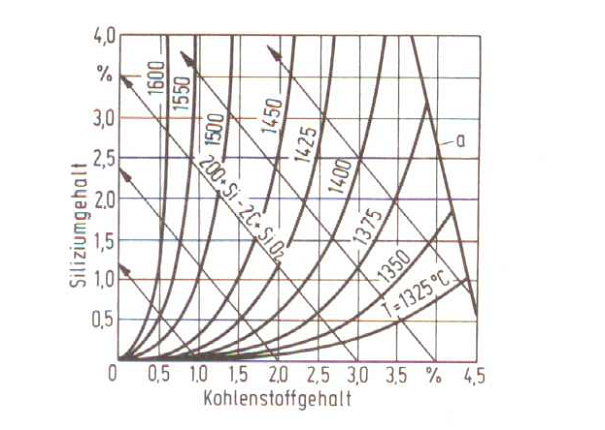 The C/Si isotherms for cast iron with flake graphite with normal carbon and silicon contents of approx. 3.5 to 4.0 percent of C and approx. 1.5 to 3.0 percent of Si lie between 1400 and 1440 ° C.
Growing silicon contents make the TG increase, grwong c contents make them decrease. In this case, silicon determines the melt oxygen content through silicic acid development (auto-desoxidation with silicon) at temperatures below or at the TG, silicon burns and creates SiO2 which passes over to the slag phase. Fig. 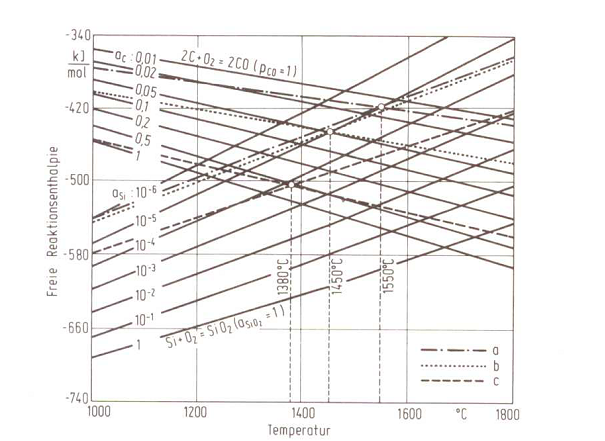 1 shows a relation for the equilibrium temperature between the carbon and silicon content, Fig. 2 shows a free reaction enthalpy for C and Si oxidation.